Robert Venturi had an outsized influence on the architecture of the 20th century, and the Guild House, built in Venturi’s hometown of Philadelphia, Pennsylvania, served as his starting point. Completed in 1963, it was one of the world’s first Postmodern buildings, an affront to the prevailing wisdom of the time among modern architects that less was more. Referencing multiple styles, one could argue that it’s downright ugly. This may explain why, despite its historical significance, it has become an overlooked relic, an afterthought in Venturi’s oeuvre; in fact, it’s not even the most important building of his in the city — that title would belong to the house he built for his mother, the eponymous Venturi House. 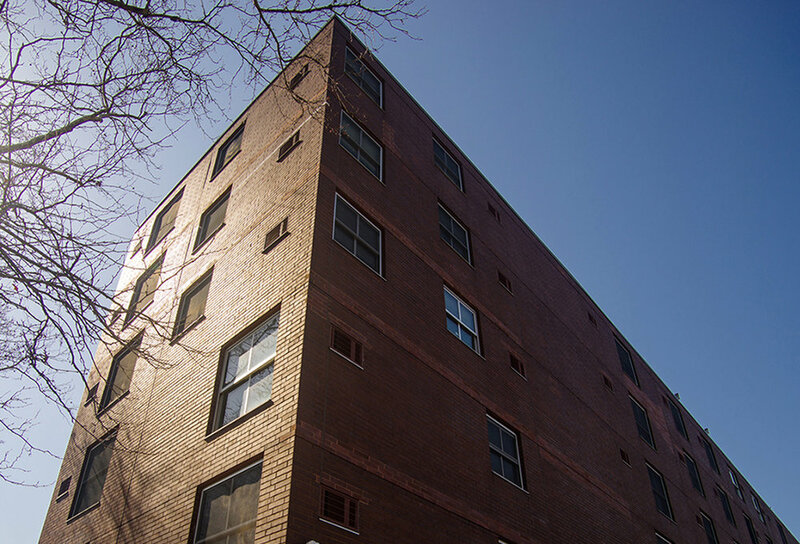 Today the Guild House continues to function for its original purpose, to house low-income elderly residents. Groups are often welcomed for tours, but, as was explained to me when I arrived, photographers are less so. So I was lucky to capture the interior of such an important landmark. And while doing so it became clear that the beauty of the building was beside the point to Venturi. What made his vision so radical, or so it seemed to me, was that here he was saying that a building didn’t have to be designed and constructed based on a narrowly defined set of rules, as was the case with the Modernists before him. Architecture, the Guild House seems to whisper as you walk through it, is a fundamentally creative pursuit whose only fidelity is to functioning faithfully and as intended. One year after launching their first book ‘Summer Diary’ Arthur Groeneveld and Bamboo van Kampen - Arturo Bamboo - present their second publication: ‘PRIVÉ’. Photographer Damien Drew explores the traditional Japanese aesthetic WABI SABI, a world view centered on the acceptance of transience and imperfection. Photography duo Arturo Bamboo, Arthur Groeneveld and Bamboo van Kampen, switched Berlin city-life for a slower island pace on Formentera, the smallest of the Balearic Islands. We set down with producer and composer Adamo Golán to talk about experimental music, Japanese culture, and his debut album “Exile and the New”. Italian artist, photographer and environmentalist Francesca Rivetti talked with Whitelies about her fight for the ocean and the importance of protecting it. It is a decades long disagreement and is one of the worlds most controversial conflicts to date. The Palestine/ Israel discord by photographer Kelvin Bugler. Noemie Reijnen examines the female role in art and society, while exploring the historical Roman sights. Intimate photographs of cars and bodies by Polly Brown. Photographer Zach Pontz new work is a study on authenticity of a bygone metropolis. The project aims to determine whether Charleston’s charm got preserved or morphed into a simulacrum. Photographer Adrien Blondel conceptualizes the sound of his surrounding by dissociating form from meaning. Inspired by Młoda Polska (Young Poland) artistic movement, this project by photographer Joanna Wzorek is a way of of showing healthy patriotism and features only Polish citizens and designs. Designed by Robert Venturi the Guild House, located in Philadelphia, is one of the first postmodern buildings and a witness of game-changing, architectural changes and creativity. An interview with Stefanie Moshammer - the young photographer, who tells heavenly honest visual stories. Pawel Jaskiewicz documents places, which are considered to have a lack of relevance. Altered landscapes and repurposed spaces. Paris, 19ème arrondissement, Rue de Flandre. Monumental apartments with brutalist accents designed by architect Martin van Treeck. Anton Privitera captures the small gestures and magical moments within London's urban jungle. Award-winning Nicolas Grospierre’s project Modern Forms. A Subjective Atlas of 20th Century Architecture. Selected Body Works by Màrio da Motta Veiga. The exploration of humanity through human forms. Graduating in 1990 from the School of Visual Arts, Robert Lazzarini still lives and works in New York City, NY. Whitelies sat down for a conversation with him. An interview with young photographer Samuel Bradley about his British heritage and post-Brexit times. Mickalene Thomas is a Brooklyn, NY based artist, who challenges the image and ideas of women and femininity through her work. Geert Goiris's project "Activist" shows us traumatic realism. An interview with Maria Foerlev of design/ art gallery Etage Projects. A photographic survey of post-war British architecture captured by Simon Phipps. Housing diverse events during the 1929 World Fair in Barcelona the ancient Greek inspired German Pavilion designed by Ludwig Mies van der Rohe was the sign and peek of modernity. In this photographic series, Viviane Sassen and her muse Roxane Danset continue writing the shared visual journal they began in 2012. Anton Polyakov's visual diary showing the youth culture in Transnistria. Painting graffiti at the age of fourteen made Tobias Faisst want to become a graphic designer.